Our venture into Rioja was an extension of a weeklong trip covering Bilbao and San Sebastián (I’ll be sharing posts on these trips shortly) and we focussed on just one area of Rioja - the Alavesa region - which sits between the Ebro River and the Cantabria Mountain range; sheltered from the cold northern winds the area is certainly ripe for producing some stunning wines. There are around 125 wineries to visit (unfortunately we didn’t manage all of them!) 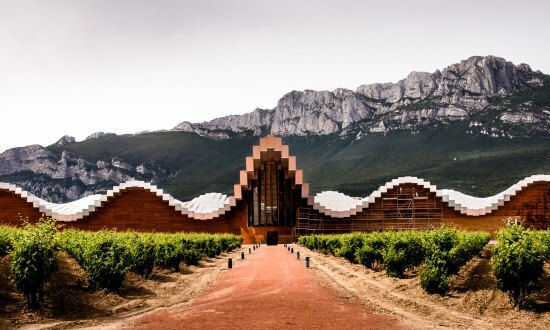 from rustic Bodegas melding into the landscape with their honey-coloured stone to a collection of architectural show-pieces such as Bodega Ysios (designed by the famed architect Santiago Calatrava); an amazing masterpiece with its undulating aluminium roof mimicking the shapes of the sierra beyond. 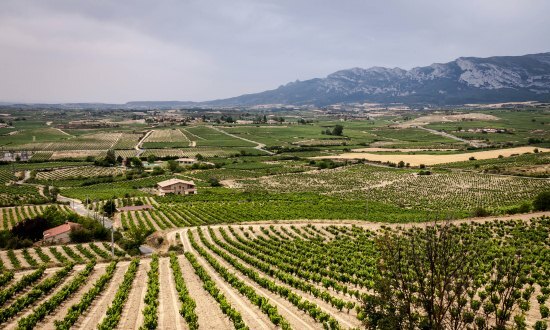 Wineries offer tours and tastings and there’s a nifty little Rioja-Alavesa Wine Route to follow. When you want a break from the wine (as if) you can turn back time by pootling around the hilltop villages such as Laguardia, Elciego and Briones where charming stone houses line the medieval streets; here life and the economy revolves around the gentle routine of vineyard, wine cellar and food. Then you have the wonderful Vitoria-Gasteiz - the capital of the Basque Country - with its pretty old town, great shopping, green spaces, rich cultural heritage and modern urban planning; you quickly see why it’s considered by Spaniards to be one of the best places to live. 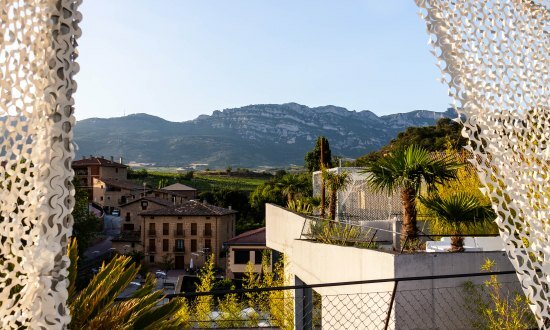 In terms of places to stay, there are some stunning modern hotels with the most famous being the Hotel Marqués de Riscal, situated on the winery of the same name. Set amidst vineyards and in the shadow of the medieval sleepy village of Elceigo, the hotel hits you fairly and squarely between the eyes; it works though and certainly doesn’t jar with its surroundings. 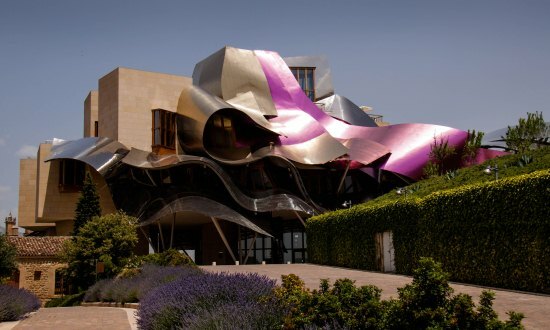 Designed by Frank Gehry (he of the Guggenheim in Bilbao) the hotel is breath-taking, bold and beautiful; its roof is made up of gleaming waves of gold and rosy pink coloured titanium that seem to float on the sandstone blocks below. Here you have a Michelin starred restaurant, divine Vinotherapy spa with an indoor pool and sunbeds that look out over the vines plus, a first for me, red toilet rolls - obviously getting carried away with the grape theme! The hotel is a destination in itself and definitely worthy of its own weekend trip. 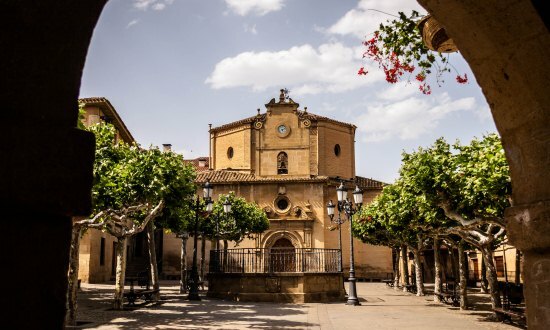 Everything the Rioja-Alavesa region has to offer is less than a two hour drive from Bilbao airport (serviced by direct flights from Manchester and other UK airports). Here you can see experimental architecture, traditional village life taking place in medieval hilltop villages, tour wonderful wineries and of course sample the delights of some of the world’s finest wines. A trip here can either be a standalone visit or, as the Hubby and I did, combined with other places in the Basque Country. The whole region is an absolute delight. For more details on this trip or any other I feature in my monthly Blogs, please feel free to contact me.